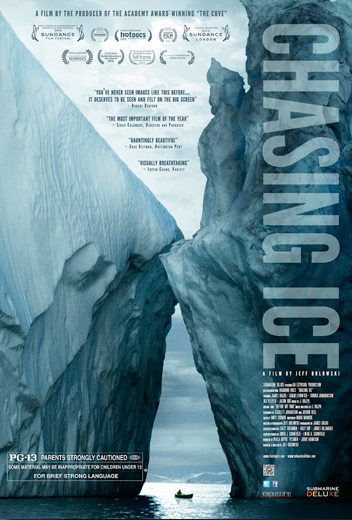 Le film polaire « Chasing Ice » a remporté déjà 23 awards en ce compris en 2012 l' »Excellence in Cinematography Award: US Documentary » au célèbre Sundance Film Festival. Je vous invite à visualiser ci-dessous la bande annonce du film produit par Jeff Orlowski. Je vous le recommande, tout simplement instructif! « … In the spring of 2005, acclaimed environmental photographer James Balog headed to the Arctic on a tricky assignment for National Geographic: to capture images to help tell the story of the Earth’s changing climate. Even with a scientific upbringing, Balog had been a skeptic about climate change. But that first trip north opened his eyes to the biggest story in human history and sparked a challenge within him that would put his career and his very well-being at risk.